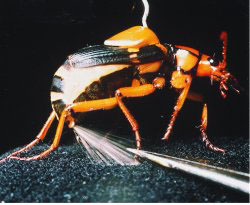 The bombardier beetle is a small insect whose habitat is under rocks that are found in the moist flood plains of rivers, lakes, and temporary post-rainstorm ponds of southern Canada, the United States, and Australia. This unique insect defends itself by firing a boiling hot spray from the rear of its abdomen when assaulted. This spray allows the beetle to unfurl its wings from under wing covers and fly away. The spray is formed at the moment of firing by mixing chemicals from two glands in the beetle's abdomen. The spray changes instantly into a gas and is directed away from the beetle. The gas irritates the eyes of the enemy and forms a smoke screen that helps the beetle to escape while the enemy is confused. Two chemicals, hydroquinone and hydrogen peroxide, collect in a reservoir that has a valve controlled opening into a thick-walled reaction chamber. The reaction chamber is lined with cells that secret peroxidases and catalases, enzymes that rapidly break down the hydrogen peroxide and hydroquinone. When the contents of the reservoir are forced into the reaction chamber through a muscle-controlled valve, a reaction quickly occurs. Hydroquinone is changed into p-quinone and the hydrogen peroxide into water and oxygen. There is enough heat generated from the reaction to bring the mixture to the boiling point and vaporize some of it creating pressure in the reaction chamber. The products of the reaction are expelled explosively through openings at the tip of the beetle's abdomen. Balance the equation for the reaction that occurs in the reaction chamber of the bombardier beetle. How many grams of water can be formed if 1.00 grams of hydrogen peroxide reacts with 2.00 grams of hydroquinone in the reaction chamber? If 1.00 grams of hydrogen peroxide and 2.00 grams of hydroquinone are added to the reaction chamber, which is the limiting reactant? What is the excess reactant and by how much is in excess?